All over the festive season, TheJournal.ie is bringing you little things to help keep your mental health in check. THE FESTIVE SEASON can be a whirlwind. It’s the busiest (or at least most stressful) time of year for many people – and that can take a toll on the amount of sleep we all manage to get every night. Christmas is over, sure, but have you caught up on your Zs yet? As part of TheJournal.ie‘s series taking a closer look at the HSE’s #LittleThings campaign, we’re letting you know the small but crucial ways in which you can ensure you’re taking care of your mental health. According to the Mental Health Foundation’s 2011 report into sleep, without adequate sleep we cannot function effectively. It’s as important as other vital processes, like eating, drinking or breathing. Not only does sleep refresh our bodies, but it also restores and repairs our minds. Sleep isn’t about being inactive – in fact, it’s quit the opposite. Sleep is an essential time for the body and mind. Without it, our ability to use language, sustain attention, understand what we read and summarise what we hear all suffer. Check out the image below – it shows that those who deprive themselves of proper sleep are more at risk of not only stroke and heart disease, but also anxiety and depression. According to the MHF, insomnia is the most commonly reported mental health complaint in the UK. Almost all of us have experienced the discomfort a sleepless night – although one is nothing to worry about, as we can “repay” this sleep debt in the next few nights. However, a structured routine around sleep is essential, so try to keep everything ticking over regularly. Insomnia may lead to a napping habit, which in turn can lead to further insomnia. Try to cut out napping in order to achieve deep sleep at night time. Our own mental state is key to preventing insomnia from developing from an issue to a chronic problem. Try not to neglect your sleep if you are feeling in any way anxious or stressed. How much sleep do we really need, though? The short answer is that there is no universal amount of time a person needs each night – it varies for everyone. Find out how much feels right for you, and try to ensure you get it. Speaking to TheJournal.ie, she explained that a good night’s sleep means waking feeling rested. One very good tip is to write down the things you’re worried about before you go to bed – like a to-do list, for stuff you can deal with tomorrow. Don’t hold it in your mind, or run it over and over, or ruminate. This will lead to waking up and worrying. Write it down. If you find that difficult times affect either the quality or how much sleep you get, there are some things you can do. Lots of things can disrupt your sleep patterns – not just stress – but luckily there are steps you can take to turn things around. O’Connor advises that eating too late disrupts you – both “mentally and physically” – and that we should lead by shutting off and putting away their smartphones (even in another room entirely) before bed. “It feels normal to bring your phone to bed,” she says, but if you don’t, “you will feel better.” She always says that, traditionally, the more hours of sleep you get before midnight the better. People need to get alarm clocks. Make sure that your phone isn’t in your room – she advises making your bedroom “a haven”. If you’re having sleeping problems, you should think strongly about cutting back on caffeine, alcohol and nicotine. Starting and sticking to a routine is one great route to good sleep – go to bed at the same time every night and the same in the morning. Limit your bed to sleeping, so you associate it with drifting off and nothing else. Things like a warm drink (like your Mammy used to make) and lavender can also help. Relaxation is crucial too, so maybe take a bath, meditate, listen to music, use deep breathing techniques, yoga, etc, to get into the right state of mind. Don’t tackle anything that makes you anxious right before bed. Below is a talk-down – one of many available on YouTube that can guide you into sleep. 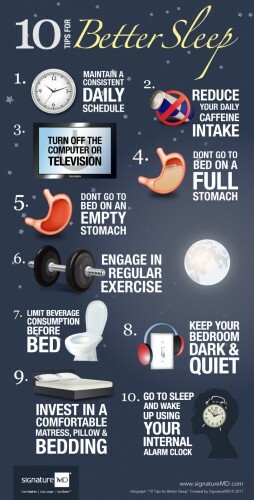 Take a quick look at this infographic to see how else you could improve your chances of entering the land of nod. How many things could you improve on? Email “Why getting enough sleep is vital - and how to get it”. Feedback on “Why getting enough sleep is vital - and how to get it”.